A trusting little girl meets a scheming wolf on the way to her grandma's house. Once upon a time there lived on the borders of a great forest a woodman and his wife who had one little daughter, a sweet, kind child, whom every one loved. 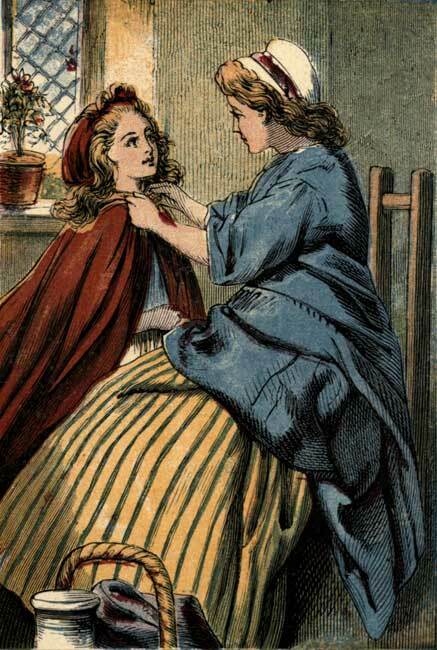 She was the joy of her mother’s heart, and to please her, the good woman made her a little scarlet cloak and hood, and the child looked so pretty in it that everybody called her Little Red Riding-Hood. One day her mother told her she meant to send her to her grandmother—a very old woman who lived in the heart of the wood—to take her some fresh butter and new-laid eggs and a nice cake. Little Red Riding-Hood was very pleased to be sent on this errand, for she liked to do kind things, and it was so very long since she had seen her grandmother that she had almost forgotten what the dame looked like. The sun was shining brightly, but it was not too warm under the shade of the old trees, and Red Riding-Hood sang with glee as she gathered a great bunch of wild flowers to give to her grandmother. 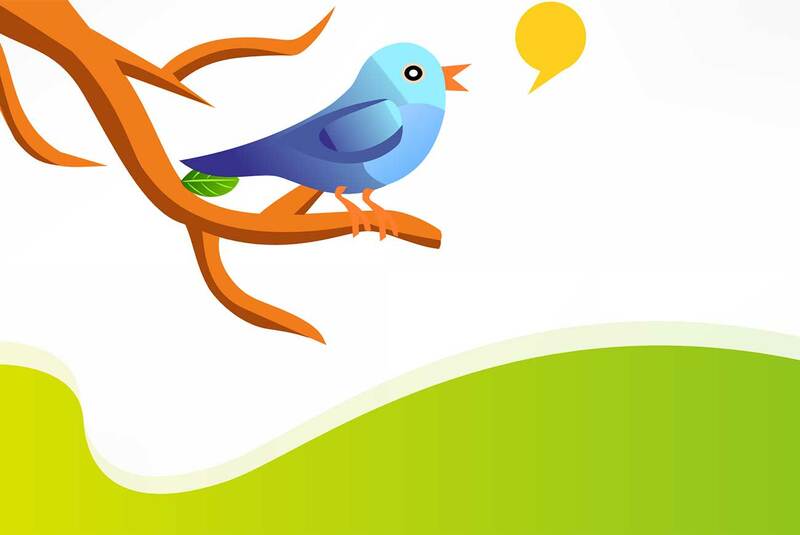 She sang so sweetly that a cushat dove flew down from a tree and followed her. “Where does your grandmamma live?” asked the wolf. “Quite in the middle of the wood,” she replied. 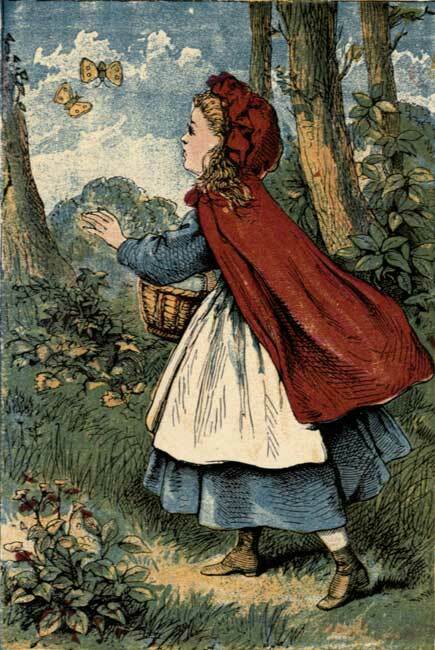 Little Red Riding-Hood was not in a hurry, and there were many things to amuse her in the wood. 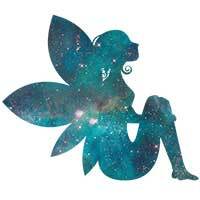 She ran after the white and yellow butterflies that danced before her, and sometimes she caught one, but she always let it go again, for she never liked to hurt any creature. And then there were the merry, cunning little squirrels to watch, cracking nuts on the branches of the old trees, and every now and then a rabbit would hurry away through the tall ferns, or a great bee come buzzing near her, and she would stop to watch it gathering honey from the flowers, and wild thyme. So she went on very slowly. By-and-by she saw Hugh, the woodman. While Little Red Riding-Hood was at play in the wood, the great wolf galloped on as fast as he could to the old woman’s house. Grandmother lived all by herself, but once or twice a-day a neighbour’s child came to tidy her house and get her food. 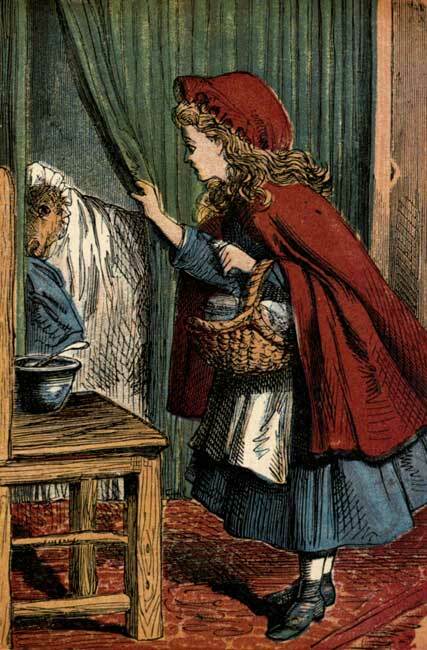 Now, grandmother was very feeble, and often kept her bed; and it happened that she was in bed the day Little Red Riding-Hood went to see her. When the wolf reached the cottage door he tapped. “Who is there?” asked the old dame. “Little Red Riding-Hood, granny,” said the wolf, trying to speak like the child. 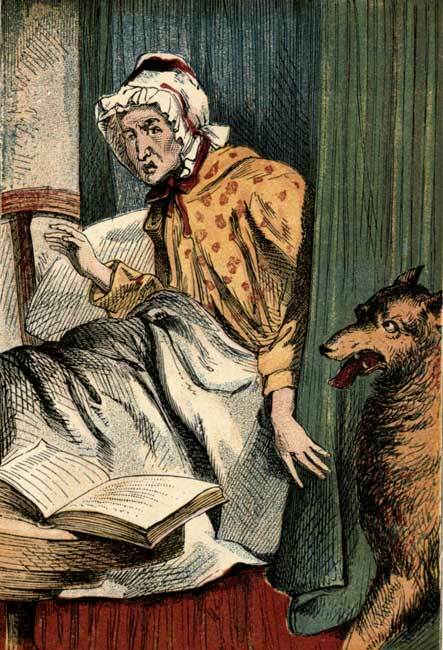 The wolf did as she told him, went in, and you may think how frightened poor grandmother was when she saw him standing by her bed instead of Little Red Riding-Hood. Very soon the wolf, who was quite hungry after his run, ate up poor grandmother. Indeed, she was not enough for his breakfast, and so he thought he would like to eat sweet Red Riding-Hood also. Therefore he dressed himself in granny’s nightcap and got into bed, and waited for the child to knock at the door. But he waited a long time. 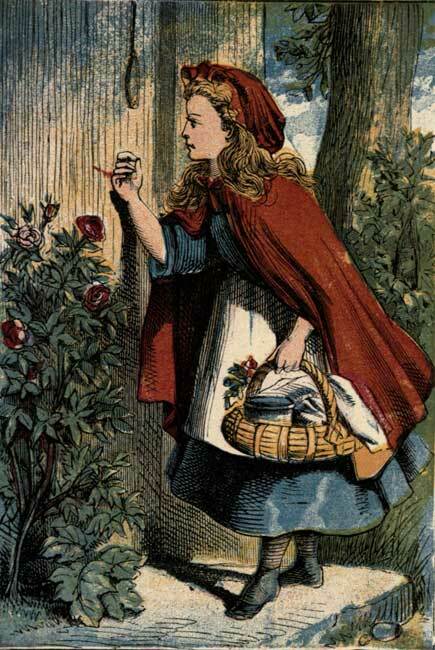 By and by Little Red Riding-Hood reached her grandmother’s house, and tapped at the door. Red Riding-Hood thought grandmother must have a cold, she spoke so hoarsely; but she went in at once, and there lay her granny, as she thought, in bed. “If you please, grandmamma, mother sends you some butter and eggs,” she said. 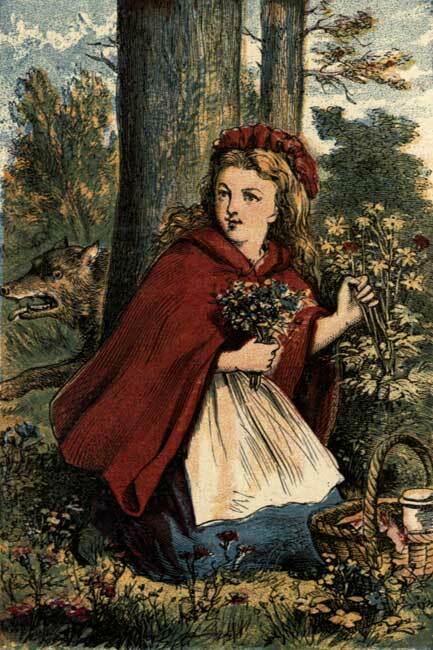 “Come here, dear,” said the wicked wolf, “and let me kiss you,” and Red Riding-Hood obeyed. But when Red Riding-Hood saw the wolf she felt frightened. She had nearly forgotten grandmother, but she did not think she had been so ugly. “All the better to smell with, my dear,” said the wolf. “All the better to see with, my dear,” said the wolf, showing his teeth, for he longed to eat the child up. “Oh, grandmamma, and what great teeth you have!” said Red Riding-Hood. 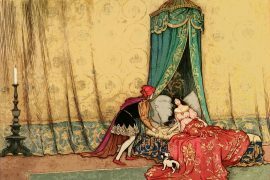 “All the better to eat you up with,” growled the wolf, and, jumping out of bed, he rushed at Red Riding-Hood and would have eaten her up, but just at that minute the door flew open and a great dog tore him down. 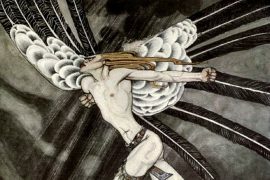 The wolf and the dog were still fighting when Hugh, the woodman, came in and killed the wicked wolf with his axe. Little Red Riding-Hood threw her arms round the woodman Hugh’s neck and kissed him, and thanked him again and again. 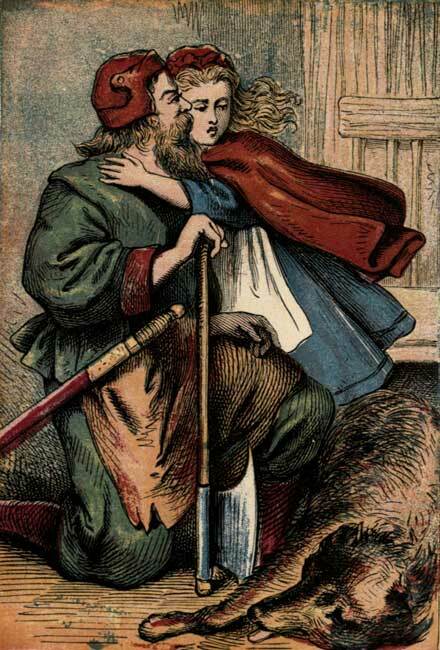 Then Hugh took the child home, and her mother and father could not thank him enough for saving Little Red Riding-Hood. 1. 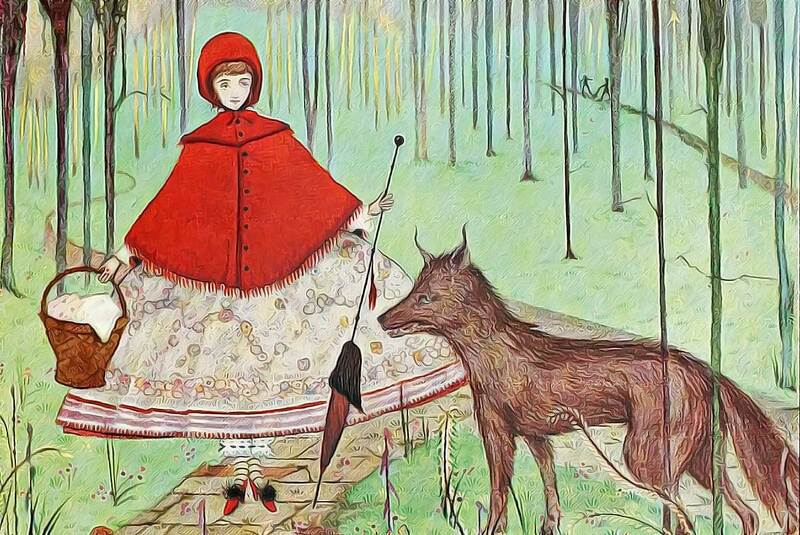 Little Red Riding-Hood told the Wolf where she was going and what she was doing when she met him on the path. Do you think this was a good idea? Why or why not? 2. 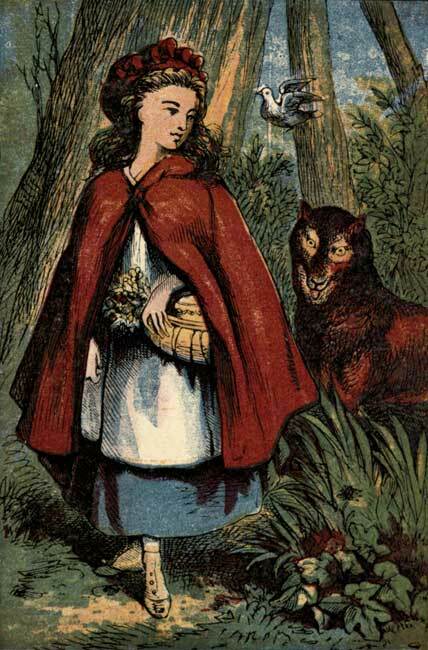 If Little Red Riding-Hood did not want to tell the Wolf where she was going and what she was doing, what are some good things she might have said to him instead? 3. Can you think of some other questions that strangers might sometimes ask, that could be dangerous for children? 4. When might it be okay to tell a stranger your name, your address or where you are going? 5. Does a stranger always look hairy, with big arms, and big teeth, and big eyes, like the Wolf? 6. Likewise, if a person is hairy, with big arms, and big teeth, and big eyes, should you be scared of them? 7. How do you think you might be able to tell if a person is a nice stranger or a not-nice stranger? 8. Little Red Riding-Hood and her mother wanted to take a cake to Little Red Riding-Hood’s grandmother because she’d been sick. Have you ever looked after someone when they were sick? What did you do to help make them feel better?